Officially this is an electric 4 string Mandolin, hence Mandobird IV, however you can tune it to be a Concert Ukulele, (you need to put on lighter gauge strings if you want re-entrant tuning). This is the closest Ukulele size instrument I could find to resemble the Gibson Firebird/Explorer Guitar body shape. It's the same basic size but the neck is much thinner so the gaps between strings are smaller making it a little harder to play; but easier to barre. So with the other Ukuleles I have that pay homage to classic electric Guitars this makes a good addition to the corner. 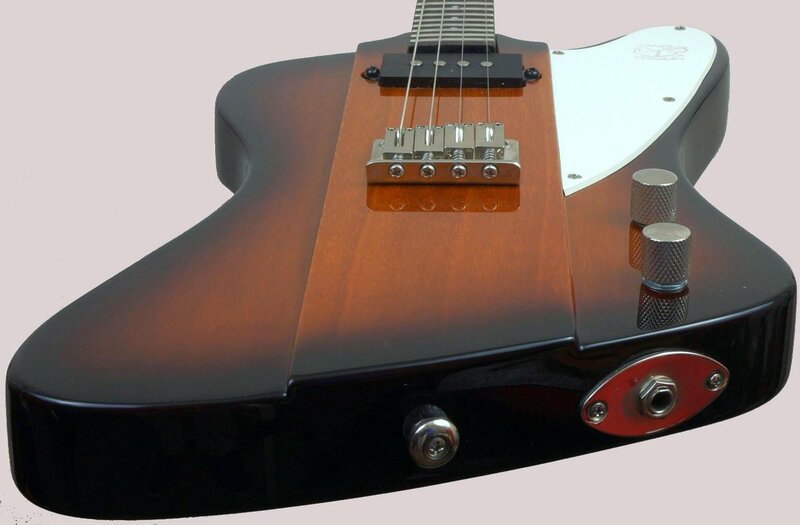 I always think of Mandolins as having 8 strings and you can get an 8 string version of this called the Mandobird VIII so I feel justified in treating this as a Ukulele not a Mandolin. I have got proper 8 string Mandolins, including another Epiphone that is a more traditional shape and I tune and treat this as a Mandolin.